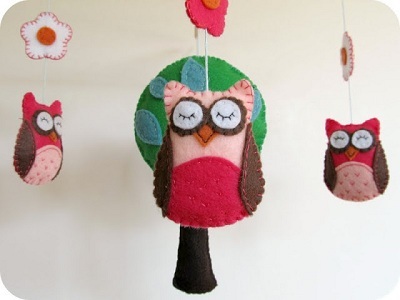 Let little these cute little owls keep baby's mind stimulated by making this colorful crib mobile. Making a mobile for your baby's crib can be really easy. This pattern requires two wooden dowels some string and different colors of felt fabric. Felt is used to sew a tree that hangs in the center and four owls with flowers above their heads. It only takes a few dollars and a small amount of time to sew together an awesome crib mobile. Handmade baby items are warm and thoughtful gifts and help make a baby's nursery more charming and beautiful.